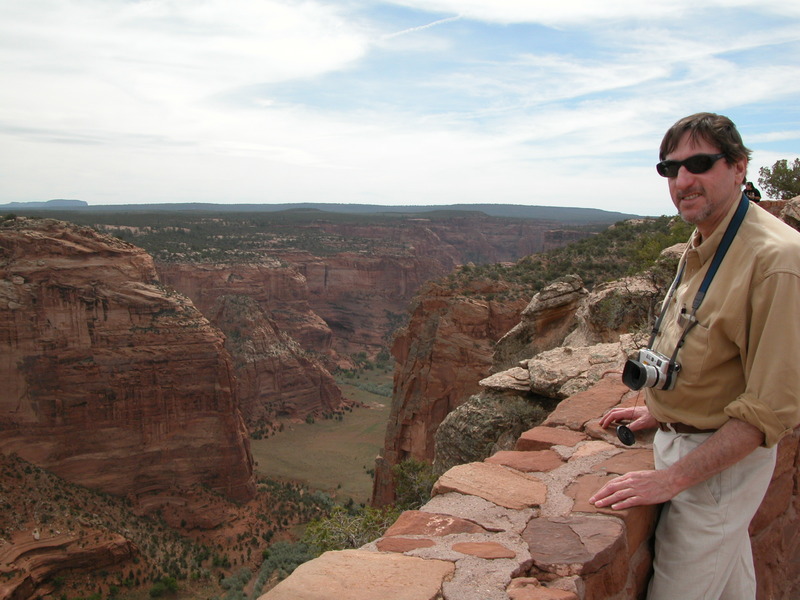 CHINLE, ARIZONA – There are only certain prescribed ways that you can see Canyon de Chelly, all have to do with Native American guides who must accompany you into the National Monument. It is the only National Park site that resides exclusively on Indian Reservation land, therefore the National Park Service only “administers” the area, the Canyon is operated by the Navajo Apache Nation. You can walk or mountain bike into the Canyon, take jeep and ATV tours through the wet river gorge, and even ride horseback…all just up the road from the town of Chinle, Arizona at the entrance to the Monument…but you must hire a local, Native American guide or tour company to do so. The Thunderbird Lodge is your best bet for a base in the area. 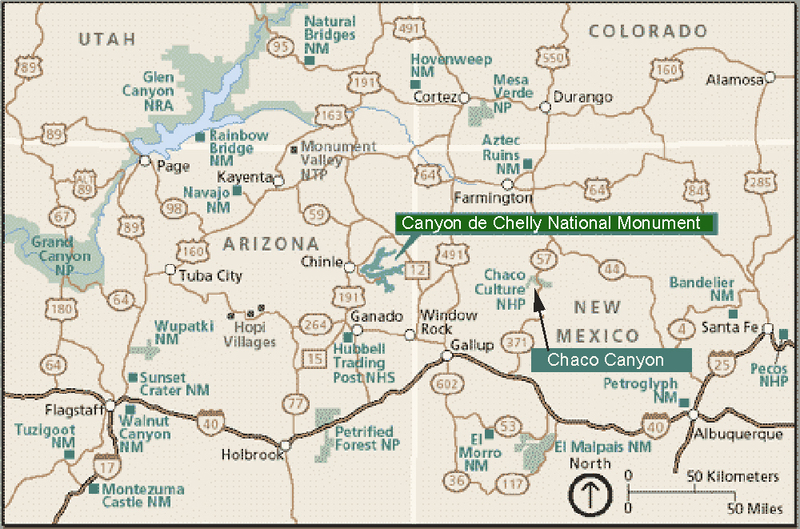 Map of Northern New Mexico and Arizona: Canyon de Chelly and Chaco Canyon, where the “Ancient Ones” lived! You get there on US 191 north from Interstate 40, or the same road south from the Four Corners area where Colorado, New Mexico, Arizona and Utah all meet. 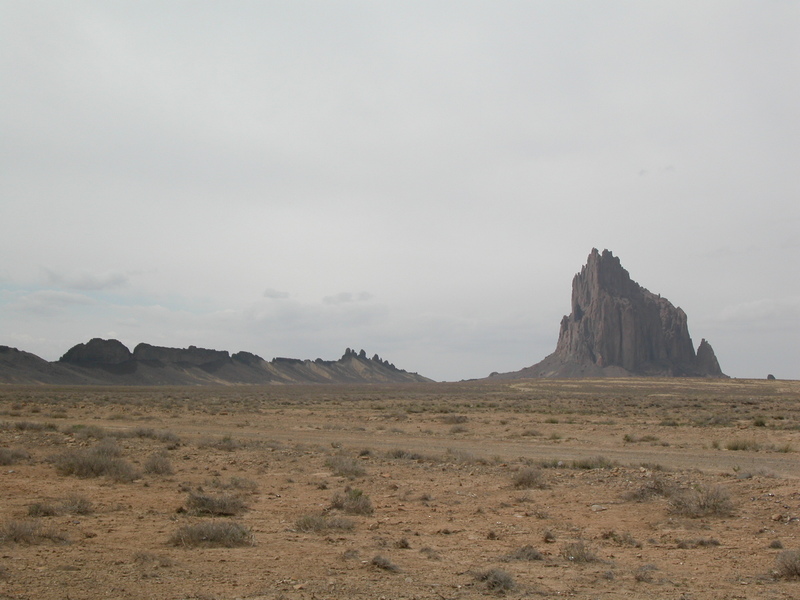 We came in from the north and the beautiful Four Corners tour that includes Monument Valley after our stay at Chaco Canyon in New Mexico, with Shiprock and other scenic vistas along the way marking our path. The 17-mile long overlook drive along the edge of the canyon rim, once we got to Chinle and the Cottonwood Campground next to the Thunderbird Lodge, gave us inspiration for the next day’s adventure. 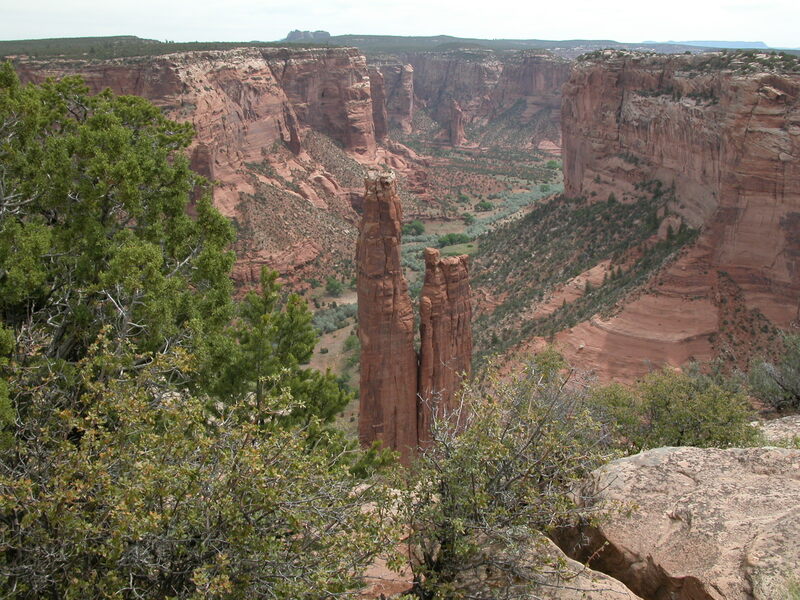 From the town, the paved drive heads southeast up the canyon rim to Cottonwood Junction Lookout, then Tseyi Overlook, Sliding Rock Overlook, and finally Spider Rock Overlook. I venture to say that most visitors only see this much of the Canyon, but if this is all you see…it’s still gorgeous! Cross-bedded sandstone from wind-blown dunes eons ago, from the Sliding Rock Overlook. 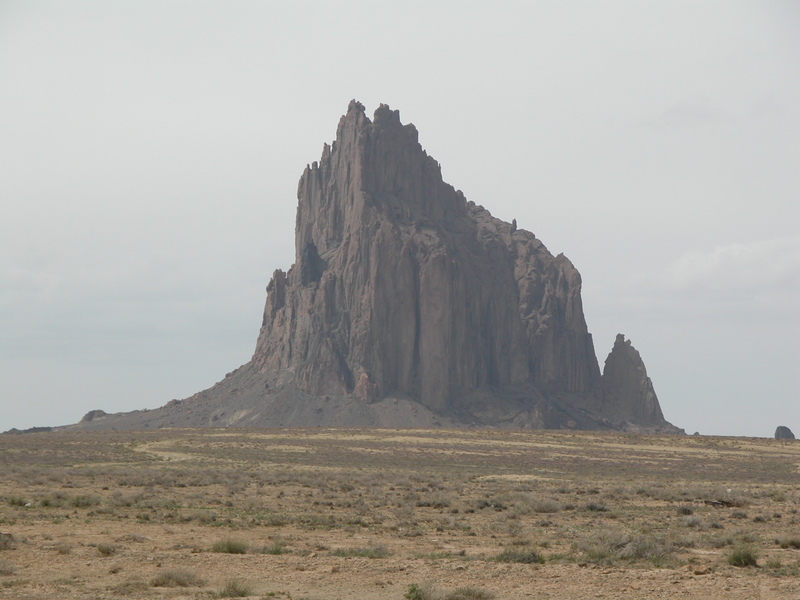 Spider Rock, seen from overlook of the same name. 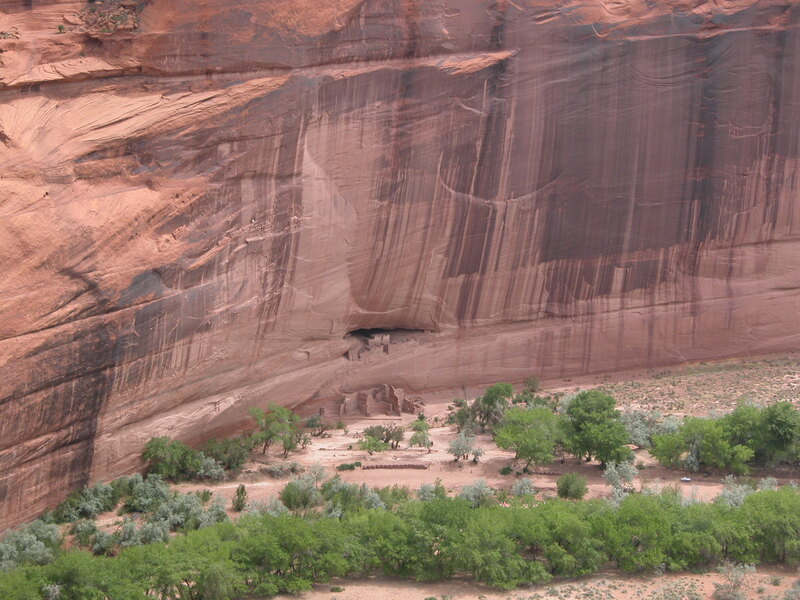 This is where the Navajo Apaches came from, where their fathers, and great-grandfather’s of great-grandfathers lived. It is a unique, narrow, verdent, green valley hidden in the vastness of the Southwestern High Desert. From the top of the mesas, the streams feeding the trees and grassy meadows transfix your vision. The stark difference between the protected and sheltered valley and the wind-swept high mesas was remarkable. Little wonder the Apaches retreated here millennia ago. The name “Chelly” is a French-like pronunciation spelling of the Spanish derivative of the original Navajo word for the canyon: Tseyi, meaning “inside the rock”. 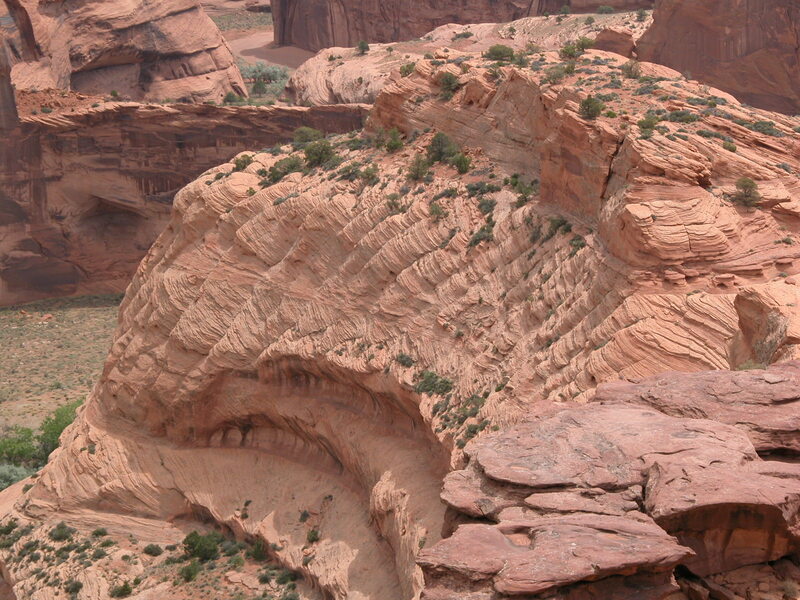 This Canyon, this Navajo Heartland, was definitely “inside the rock”! Maybe the Navajo Apache connection to the Ancient Ones who built Chaco isn’t so far fetched an idea as it first sounded! Retreating here after their culture began to breakdown in Chaco would be a natural reaction. We’ll certainly know more after tomorrow’s horseback trek for nine hours through 19 miles of this secret Canyon! ~ by Dave Etzold on March 14, 2010. Thanks the author for article. The main thing do not forget about users, and continue in the same spirit.